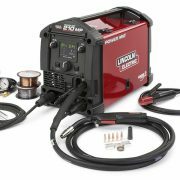 The Lincoln Handheld 120VAC MIG machine is set up to operate without using shielding gas. Instead it uses flux-core wire to shield the welding area and keep the weld clean from contamination. 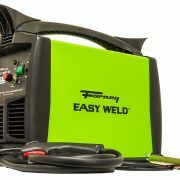 This machine has the versatility to weld mild steel, stainless steel, and aluminum, making it the perfect tool for your hobby shop. 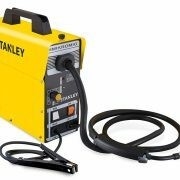 This model has a fairly wide operating range when compared to other 120 volt portable machines. This particular machine has a wire speed range of 50 inches per minute to 500 inches per minute. With this kind of flexibility, you can use the Lincoln Handheld 120VAC MIG machine for a variety of repair projects. The fully adjustable speed control all but eliminates issues with wire tangle and wire crushing. 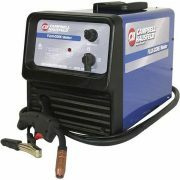 The cast aluminum body on this machine, complete with the rigid drive mechanism, ensures perfect wire alignment to keep your portable MIG welder running smooth all-day-long. The brass to brass gun connection of this model is superior to comparable lower cost brands. This enhances the conductivity to ensure reliable performance. The biggest advantage of this machine is that you can plug it into any standard wall unit. Meaning you can use it in your garage or outside in driveway or on the deck. Wire Capacity: Flux-Core wire sizes 0.030” dia. & 0.035” dia. It’s pretty hard to knock Lincoln when it comes to welders. They have been around such a long time they must be doing something right. If I had to say anything bad about this particular machine it’s the fact that it’s a flux-core model. Call me old-school, but I am a big fan of conventional MIG welding with shielding gas. It just seems to be easier for me and a little less work. 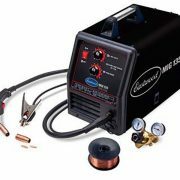 When using this welder; you should plug it into a dedicated 20 AMP circuit. The machine will run on a standard 15 AMP circuit but it seems to struggle and moan a bit. It may even trip the 15 AMP breaker if you are welding for long periods. Here’s another quick tip that will lower your frustration level; make sure you keep tension on the wire spool when you initially feed the wire into the gun, otherwise the wire can unwind in the machine and you will have a wad to untangle. It’s hard to go wrong with any Lincoln Welder, they have been around for so long they have this welding thing figured out. It’s pretty hard to beat their 7-year rectifier warranty as well. 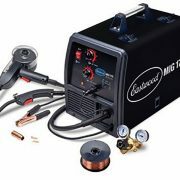 Regarding the Lincoln Handheld MIG 120VAC it’s a great machine for a hobbyist or someone building a little trailer in their garage. 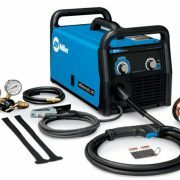 If you are planning on doing some production welding, you should step up to a 230 Volt Machine.